The third instalment of the seasonal Brit comedy returns to St Bernadette’s school as another new teacher, Mr Shepherd (Clunes) is drafted in to bring some order to the primary school before an OFSTED inspection (the educational enforcers surely alerted by the dramatic staff turnover and the slightly suspect employment of infantile Mr Poppy). Once again, it is Mr Poppy (Wootton) who brings about the plot chaos – his pet donkey kicks Shepherd in the head, giving him amnesia that makes him completely forget his impending marriage in New York to music teacher Sophie (Tate). Cue a load of contrived scenes involving flashmobs (don’t ask) and dashing about the countryside in an elf costume, before Shepherd, Poppy and some cute kiddies end up in Manhattan for the finale. 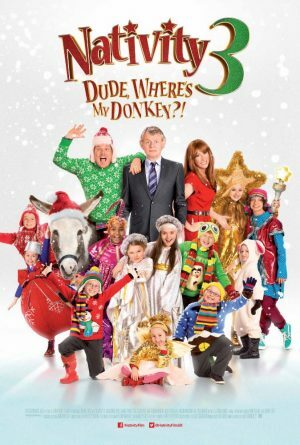 Martin Freeman and David Tennant, the previous stars of the Nativity franchise, have obviously changed their phone numbers and addresses so no producers could find them for this worst-of-the-bunch follow-up, leaving you feeling slightly sad for Clunes that he was actually at home when the phone rang. Lacking the charm of the first two movies, this instead goes for obvious gags that even children will raise their eyebrows at in disbelief. In the end, the funniest thing about this ‘comedy’ is the title. Tags: Adam Garcia, Catherine Tate, Marc Wootton, Martin Clunes, Nativity 2: Danger In The Manger, Nativity 3, Nativity!